With creative innovation as their spirit, Singer has been developing various products for every level of sewing from as early as 1851. Singer has been the pioneer in developing sewing machines and they are known to introduce first zigzag machine and first electronic sewing machine in the global market. The company is characterized with the spirit of practical design and they continue to produce the most advanced sewing machines across the globe. One such product is Singer 4423 Heavy Duty Sewing Machine from the global leaders of sewing machine manufacturers. This machine has been constructed with heavy duty metal interior frame which ensures that this sewing machine would remain still for skip-free sewing and also offers the machine with much needed durability. This comes with the stainless steel bedplate which would provide you with the smooth fabric feed and is responsible for even sewing. The machine has been constructed with the power motor. This sewing machine would reach your hands with 23 in-built stitches along with an automatic needle threader and a top drop-in bobbin system. It is to be noted that this machine has extra high sewing speed which can produce 1100 stitches per minute while the speed with other machines like Singer 7258 Stylist is only 750 stitches per minute. Steel Bedplate: The stainless steel bedplate in this machine provides the smooth fabric feed which in-turn would provide you with the even sewing. Bobbin Threading: The bobbin system in this machine is easy to load and drop-in system. This would provide you with quicker threading. Buttonhole: In this sewing machine, there is a feature of fully automated and one step buttonhole which would offer you with the professional results at the press of a button. In-built Stitches: This machine comes with as many as 23 in-built stitches that include 6 basic, 4 stretch and 12 decorative stitches. This feature makes this machine ideal for crafts, clothing construction and many more. Drop Feed: The drop feed feature would provide you with free motion sewing for the purpose of creative top-stitching. Stronger Motor: This sewing set has been constructed with 60% stronger motor when compared with the standard sewing machines and this would allow you to sew heavyweight fabrics with much ease. This is one important feature that makes this machine as one of our top 5 sewing machines in the current market. Needle Positions: There are three needle positions in this machine which could be changed according to the type of project like inserting zippers, top-stitching and so on. Needle Tension: Singer heavy duty sewing machine could be adjusted for needle tension in order to make sure that the stitch quality is stable. Free Arm plus On-board Storage: There is a free arm which would provide you with an easy access to cuffs and collars. And, on-board storage of accessories would mean that they are all always handy. Automations at Various Levels: This sewing machine set comes to your hands with various automated features. This system comes with automated needle threader which would automatically thread the eye of the needle without any strain. The automated one step buttonhole would make buttonholes in one easy step. This machine also has an option to sew automatically in reverse. This product comes with an automated presser foot for pressure control by which the amount of pressure that is exerted on the fabric would be controlled automatically. Finally, there is an automated bobbin winding clutch which would make the bobbin winding safer by disengaging the needle bar automatically during bobbin winding. 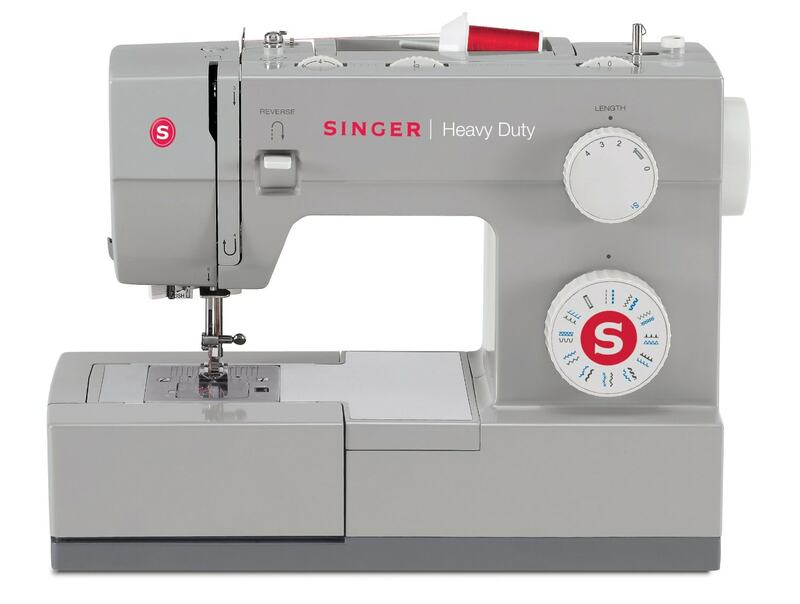 Are you wondering if maybe Singer Heavy Duty 4452 Sewing Machine is better than this one? Find out everything you need to know in our Singer Heavy Duty 4452 Review. With automations at various levels, this Singer heavy duty sewing machine is much easier to use as per the sewing machine reviews. Various features like extra high sewing speed, easy to load bobbin system, clear view cover accompanying the system, as many as three needle positions, free arm, bobbing winding clutch along with the automations everything makes this sewing machine as an easy-to-handle system with which you can experiment your creativity in quilting and stitching with greater level of comfort. The Singer 4423 machine possesses several advantages that make this sewing machine perfect for various stitching and quilting projects. The machine is portable which comes with an in-built handle, thus making it easier for transportation purposes. This machine can be mounted into cabinet within few easy steps. You can set up to a maximum of 5 mm width for sewing decorative stitches. There is an extra high presser foot lifter which would offer more clearance when multiple layers of bulky fabrics are placed. The snap-on presser feet would provide you with quick release for the purposes of easy on and off. The bobbin system provides you with an ease to insert, remove as well as to monitor the thread supply. In this machine, the stitch length can be adjusted by just a turn of the dial. In addition to these, the complete set comes with various accessories for different purposes. This product will reach you with the limited 25-year warranty with limited 2 year warranty on electrical and limited 90 day warranty on the labor. The first disadvantage with this sewing machine model is that the bobbin casing is made of plastic and it may not hold as long as the sewing machine. Another disadvantage that can be experienced with this sewing machine is that the sewing speed is quite difficult to be controlled. Thus, you can buy the Singer 4423 Heavy Duty Sewing Machine is the great entry level machine and you can purchase this one with higher level of confidence. This machine is sturdy and all the basic features are great. With this machine, you are getting assured for both household and commercial purposes.